Rome has seen its share of turmoil over the centuries and at half-time yesterday it looked as if Ireland would flood the Tiber with tears of grief. The Italians scored two tries and came from behind to take an unexpected lead. They had crossed the Rubicon and there was no turning back. The usual outcome for Italy was to blaze away like dry turf that has been left out in the sun too long. Then they faded in the third quarter, and even more so in the fourth quarter, but teams never tire when they are going forward. Conor O'Shea has improved Italy's staying power. He is a Kerryman, if not by birth, well then by choice. Conor's dad Jerome won three senior All-Irelands and he was always a very fit man right up to old age. Italy aren't quite there yet but they played for every minute of the match. For a while it seemed this could be another Tigranocerta. The Roman team of 69BC was captained by Lucius Lucinius Lucullus - his mother was fond of alliteration - and LLL's troops were only 10,000 in number. The Battle of Tigranocerta was the biggest mismatch since Dublin's Dirty Dozen or Twelve Apostles, depending on your allegiance, won the Sam in 1983. Tigranes the Great fielded an army of 300,000 at Tigranocerta. The Romans wiped out the 300,000. History doesn't record, but I wonder if the Armenian King was subsequently referred to as Tigranes the Bate. I am sure there were systems failures in Tigranocerta. Seán Cronin will be blamed for some of his throwing but it must be remembered that he was trying to connect with a new-to-him second-row pairing. Ireland made many mistakes but Conor O'Shea's team have improved this season. Wales only beat Italy by ten. Throw in the disruption due to on-field injuries and Ireland were severely disadvantaged. The last time Italy beat us we ended up with a disrupted back-line. Peter O'Mahony played on the wing that day. Rugby is all about the plan. And when the plan is failing, you go back to the tried and tested. Niall Scannell was in the same boat as Cronin. He hadn't played too much rugby with the final second-row combination of Ian Henderson and Ultan Dillane. Scannell threw three to his Munster colleague Peter O'Mahony and the plan worked. Ireland scored from two of the three throws. Ireland's pre-set back-line planning was in ruins when Bundee Aki went off injured. There was no one-for-one cover for his position. Conor Murray picked out Keith Earls with another trademark Munster pass. Earls went over and that was the winning of the game. Sexton and Murray go together like bacon and cabbage but right now they haven't yet come to the boil. Their season has been disrupted due to injuries. Murray scored a try and made another. He is taking too long to get the ball away from the base of the ruck, which gives the opposition too much time to think and reset and disrupt, but this can be worked upon. Sexton only took one late tackle yesterday. He is very close to getting it right. I would have no worries about these two. All they need is time. The wind was strong and mischievous. Kicking wasn't as easy as it seems to be from the sitting room. The wind is invisible on the television. I'm told the wind was strong enough to blow the Pope's hat off. There wasn't an Irish player who didn't give his all but some were better than others. Peter O'Mahony was our captain and, like the hawk, he swooped on his prey in the air and sunk his talons in to the ground ball. Ultan Dillane went through a tough time when his mother Ellen died around this time last year and it took him some time to find his feet. Ellen was a nurse and I have this feeling she is still nursing her young lad. Ultan always had it in him. It seems to have been forgotten that he played particularly well when we beat the All Blacks for the first time in Chicago. Dillane tackled big men to the ground by concentrating on the part of the body that is the narrowest. He went for the ankles. Down they went, every time. Ellen's boy was Ireland's outstanding player. 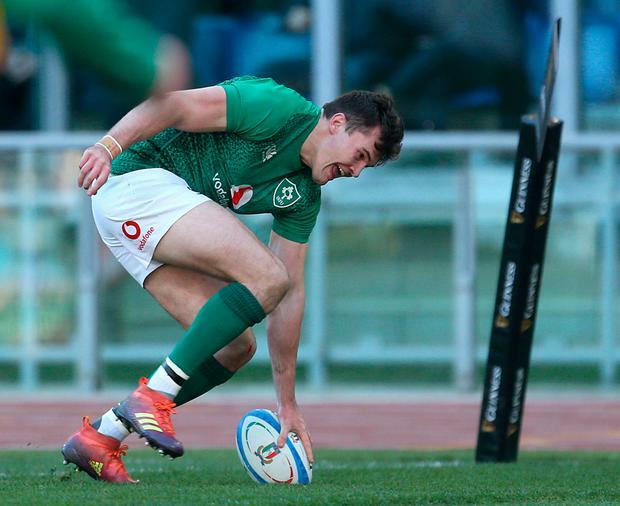 Jacob Stockdale has an eye for the try and once again he scored when Sexton floated the ball over the Italians, who foolishly advanced too far out from the touchline. He is our Jonah Lomu. These young lads kept us in the hunt for what we were told was England's Championship. Their promoters claimed England could field several teams capable of winning the Championship. When injury struck, they were found out by Wales. You would never know what might happen. Scotland will tear into Wales at Murrayfield. Conor O'Shea knows the English better than any man and Italy can deny England the bonus point in Twickenham. If Ireland can get four tries and beat France, we will still be in contention on the back nine. The good news story is a tale of two tens. Jack Carty only played for a few minutes but he's capped now. Jack has been outstanding this season. He has the cut of man who knows what he's at. Ian McKinley was deemed unfit for purpose here in Ireland by health and safety. Ian lost an eye playing rugby. He went to Italy as a 22-year-old coach and yesterday Ian came on against the country of his birth for another cap. McKinley, a real life hero, looks like Biggles in the goggles, and here is one man who is flying high on the elixir of sporting participation.